Smurfs are little blue anthropomorphic creatures that live in a small village hidden away in a forest. Adult Smurfs are no more than "three apples tall". They have a pear shaped body, an oval head, and a short stubby tail. As far as we know all naturally born Smurfs are male. Smurfs are named after their personality or profession. Costume includes a soft blue and white bunting with a fabric fastener, and an incredibly cute Smurf hat. 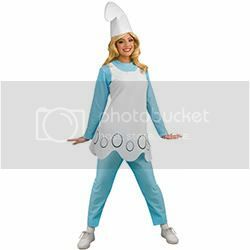 Costume includes a soft blue and white romper with attached shoe covers and a small, round tail and a white Smurf hat. Costume includes blue and white jumpsuit, white hat, blue mittens and white shoe covers. 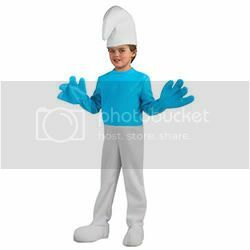 Costume includes bright blue shirt, matching mittens, white pants, shoe covers and a white smurf style hat. These are your basic Smurf Costume. They're perfect if you want to be Clumsy or Grouchy Smurf. For Brainy you can add large round glasses (Harry Potter style). If Gutsy is your favorite put on fake sideburns and add a short kilt to the costume. Did you know Smurfette was originally created by Gargamel to cause trouble for the Smurfs? He made her with blue clay and magic. At first she wasn't very attractive. She had messy black hair and a big nose, and a plain dress. Papa Smurf later turned her into a real Smurf. She became nicer, and her appearance totally changed into the Smurfette we all know and love. She was the only female Smurf for years, until Sassette who was also created from clay. Then Nanny Smurf appeared, though we aren't sure where she came from. Costume includes a blue romper with an attached white dress, attached shoe covers, and a matching white hat. Costume includes a soft blue top with attached white dress, a pair of matching blue pants, and a white hat. Costume includes white dress featuring oval accents and attached blue sleeves, blue pants, and a white smurf hat. If you have blonde hair you are all set. If not, add a blonde or yellow wig and you are good to go. Papa Smurf is the village leader and father figure of the Smurfs. He is perpetually 542 years old. He has white beard and moustache and, unlike the other Smurfs, wears a red hat, pants, and shoes. Honestly the Papa Smurf costumes that are out there right now look more like garden gnomes to me. Or, a really skinny Santa Claus. I just can't promote them. If newer ones come out that are better quality I will share them with you here. The only Papa Smurf piece I think worth showing you is the latex mask you see below. You can wear it with a blue shirt, red pants, and red shoes. Smurf mitten hands are easy to find if you want to complete the look. Quiz: Which Smurf Are You? There is a Grouchy Smurf kid's latex mask. You can wear it with a blue long sleeve shirt and white pants. Totally fun! I loved watching the Smurfs too!